AFMC MBBS Admission 2019 – On successfully clearing the NEET (UG) Exam, the candidates were required to register themselves on the Medical Counseling Committee website www.mcc.nic.in previous year. It will be updated here if the same process remains this year or if there are any changes. The registration will be completed by clicking on the subhead “AFMC Medical Counseling” under the “UG Medical Counseling” tab. 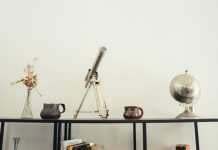 The selected, the waitlisted result will be published on the website. Selected candidates must report for admission. Candidates can get all the information from this article. Latest: No separate registration on this site is required for AFMS MBBS admissions for the year 2019. scroll down to check the same. 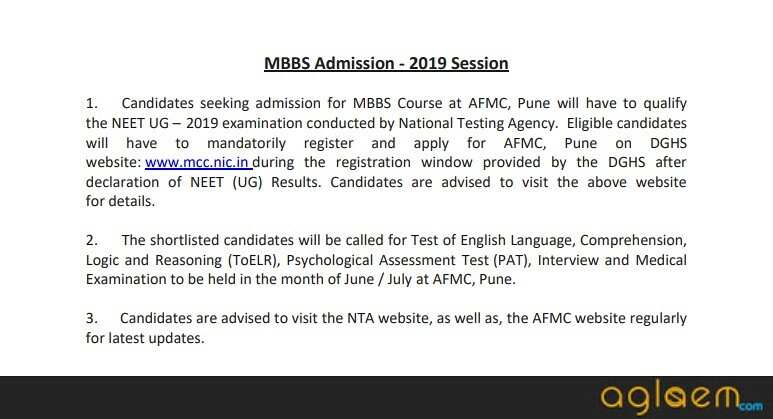 Admission to AFMC 2019 is on basis of NEET scores. If you want to take admission in Armed Forces Medical College then, first of all, register for the counselling organised by MCC. Further to express interest in AFMC MBBS 2019 and be considered by the college for admissions, submit AFMC MBBS 2019 application form. Eligible candidates who are interested to join AFMC Pune, to pursue the MBBS course will have to mandatorily register and apply for AFMC, Pune on DGHS website: www.mcc.nic.in during the registration window provided by the DGHS. Nationality – A candidate should be the citizen of India. Foreign nationals of Indian origin may be admitted into AFMC only after they have acquired Indian Citizenship or in respect of whom the Ministry of Home Affairs issues a certificate of eligibility. Marital status – Must be unmarried. Marrying during the course is not permitted. Medical fitness – Should be medically fit as per prescribed standards by the Govt of India, Ministry of Defence. taken simultaneously and securing not less than 60% of the aggregate marks in the three science subjects taken together and not less than 50% marks in any of the four subjects. They must have also passed an examination in Mathematics of the tenth standard. Age Limit – The candidate should have attained the age of 17 years on 31 Dec 2019 but must not have attained the age of 24 years on that date i.e. must have been born not earlier than 01 January 1995 and not later than 31 December 2001.
eligible for admission to AFMC, Pune. The candidates will be required to produce originals of all certificates/marks sheets, NEET UG – 2019 admit card (hall ticket), NEET UG scorecard and the original certificate of NCC, Sports certificate at school, District, State & National /International level if any at the time of the screening at AFMC Pune. All candidates will produce result or proof of having appeared in the qualifying examination held on or before the scheduled date at the time of the screening (if the result of such examination has not been declared). Original mark sheet & pass certificate of qualifying examination, however will have to be produced prior to admission. On the basis of the NEET UG – 2019 score and screening at AFMC, two merit lists, one for boys and one for girls, will be drawn up and admissions will be offered only to these shortlisted candidates in accordance with their final merit position. The remaining candidates will be on the waiting list. The result has been displayed on the website stated above and at the O/o DGAFMS and Admission cell AFMC Pune. Read complete AFMC MBBS Admission 2019 details here. Why should I apply for AFMC MBBS Admission 2019? Armed Forces Medical College enjoys a high rank among medical colleges. 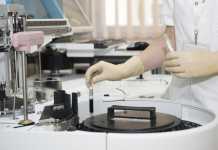 MBBS admission in AFMC is a competitive process. AFMC Pune is a reputed medical institution. In fact, many college rankings place it among the top 3 medical colleges in India. You should apply to AFMC for MBBS 2019 Admission if you wish to study in AFMC Pune. For more information Regarding AFMC MBBS Admission check – 2018 Information Brochure. Sir,I am serve in Army as Subedar.My native Tamil nadu.my daughter not apply to NEET.she is qualify for admission in AFMC .without NEET?for MBBS 2017? AFMC admission for MBBS without NEET ?2017. As per AFMC cut off marks in NEET for boys is 575. If your son got 575 and above marks, you can apply for AFMC. Sir I am a ESM ,my son scored 542 in NEET 2018 and AIR is 9156 ,wll he be able to get a seat in AFMC please guide for procedure. Respected mam/sir i have ? can candidate get admission in afmc by passing compartment exam in the same year. yes if the candidate will clear the compartment exams.